WASHINGTON (June 28, 2018) — Bladder cancer is relatively common and imposes the highest per patient cost on the U.S. health care system than the management of any other cancer type. Now, a new test could be key to reducing the cost of care while at the same time relieving some patients of unneeded overtreatment, say investigators led by Georgetown Lombardi Comprehensive Cancer Center researchers. Deciding whether to treat bladder cancer aggressively has been difficult — predictive diagnostic data is limited. Up to 70 percent of patients treated for early stage lesions that have not invaded the bladder wall will experience recurrence of these lesions, and 20 percent of these patients will develop an invasive cancer. Because clinicians do not know which tumors will become dangerous, they err on the side of caution and perform an extremely intensive post-surgery surveillance regimen, including cystoscopy (a lighted optical scope that examines the inside of the bladder) as frequently as every three months for two years after removal of the tumor, and every 6 to 12 months for the years after. The Georgetown-led investigators offer a new solution to the dilemma. They have found that a fairly simple test significantly improves the identification of bladder tumors that will likely become invasive. The study, published in Clinical Cancer Research, “validates this test that helps predict whether an early stage bladder cancer will recur and progress,” says the study’s senior author, Todd Waldman, MD, PhD, a professor of oncology at Georgetown. Working with researchers from the U.S. and Denmark, Waldman has found that, compared with using current diagnostic procedures, the new test is 2.4 times more accurate in identifying tumors likely to recur after treatment, and 1.9 times more accurate at predicting which tumors will likely progress, invade the bladder wall, and spread. The test involves examining bladder tumors that had been removed during initial surgery for overexpression of the STAG2 gene, which Waldman earlier identified as key to development of potentially deadly bladder tumors. Checking for STAG2 is a “very simple and very robust” procedure for pathologists who routinely examine excised tumors, Waldman says. His studies have described how to run this test. Using the test could, in some cases, spare patients constant surveillance and, in others, support forgoing aggressive treatment that can produce significant side effects, the researchers say. So Waldman and his colleagues have worked on a diagnostic test for years. This study summed up several of those clinical studies, concluding that using the test “offers additional twofold predictive discrimination,” Waldman says. The study’s first author is Alana Lelo, an MD/PhD candidate at Georgetown University School of Medicine. Additional Georgetown authors include Deborah L. Berry, PhD, Brent Harris, MD, PhD, George Philips, MD, Krysta Chaldekas, and Jung-Sik Kim, PhD. Frederik Prip, Lars Dyrskjøt, PhD, Jørgen Bjerggaard Jensen, MD, are from Aarhus University Hospital, Denmark; Jeffry Simko, MD, PhD, and David Solomon, MD, PhD, are from the University of California San Francisco School of Medicine; Ciaran Mannion, MD, and Pritish Bhattacharyya, MD, are from Hackensack University Medical Center, New Jersey, and Anagha Kumar, MD, is from MedStar Health Research Institute in Washington, D.C. 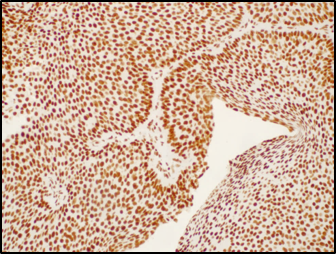 This work was supported by National Cancer Institute grants (R01CA169345, T32CA009686, DP5OD021403) and Cancer Center Support Grant (P30CA051008) to the Histopathology and Tissue Shared Resource; the Danish Cancer Society; the National Center For Advancing Translational Sciences of the National Institutes of Health (TL1TR001431); and institutional funds from the John Theurer Cancer Center at Hackensack University Medical Center. Georgetown Lombardi Comprehensive Cancer Center is designated by the National Cancer Institute as a comprehensive cancer center — the only cancer center of its kind in the Washington, D.C., area. A part of Georgetown University Medical Center and MedStar Georgetown University Hospital, Georgetown Lombardi seeks to improve the diagnosis, treatment and prevention of cancer through innovative basic and clinical research, patient care, community education and outreach, and the training of cancer specialists of the future. Connect with Georgetown Lombardi on Facebook (new window) (facebook.com/GeorgetownLombardi (new window)) and Twitter (new window) (@LombardiCancer (new window)). Georgetown University Medical Center (GUMC) is an internationally recognized academic medical center with a three-part mission of research, teaching and patient care (through MedStar Health). GUMC’s mission is carried out with a strong emphasis on public service and a dedication to the Catholic, Jesuit principle of cura personalis — or “care of the whole person.” The Medical Center includes the School of Medicine and the School of Nursing & Health Studies, both nationally ranked; Georgetown Lombardi Comprehensive Cancer Center, designated as a comprehensive cancer center by the National Cancer Institute; and the Biomedical Graduate Research Organization, which accounts for the majority of externally funded research at GUMC including a Clinical and Translational Science Award from the National Institutes of Health. Connect with GUMC on Facebook (new window) (Facebook.com/GUMCUpdate (new window)) and Twitter (new window) (@gumedcenter (new window)). Connect with Georgetown University School of Medicine on Facebook (new window) (facebook.com/somgeorgetown (new window)), Twitter (new window) (@gumedicine (new window)) and Instagram (new window) (@georgetownmedicine (new window)).